It is totally unlike me not to eat when I can’t decide what I want. In fact, normally it is the opposite – I usually eat EVERYTHING in sight when I can’t decide on one item. In my defence, we do not have any sugary, processed foods in our house. I just don’t buy them. I let my children have whatever they want to eat when they attend a party, we go out for pizza about once every 3 weeks, & allow them to have a scoop of ice-cream, but that’s it. We do not have muesli bars, flavoured yoghurt, ice-cream. Monday: As the rash on my face, is potentially caused by stress, it is important to factor in my emotional/mental well-being into the mix. I had a lovely morning with my little guy – just playing lego at home & he can be such a little darling when he is on his own. I also had a lovely long chat to my best friend which always makes me happy. I woke up with a very sore eye which I guess was a bit stressful as I had to keep my eye shut frequently or hold my hand over my eye to keep it shut, it watered all day & stung, making some of my vision a bit foggy. Food was 2 slices of Naturis rice loaf with olive oil, dried oregano & Himalayan pink salt. This is my current go to dish when I can’t be bothered to think of anything! Through the morning I also had the remainder of the purple carrot, banana & buckwheat loaf I baked last week. It has no added sweetener & I can’t wait to make it again. For dinner, I made myself rice paper rolls: 2 salmon fillets cooked in organic olive oil & gluten-free soy sauce. Coriander, mint, qukes, organic snow peas & organic carrots. And of course, the rice paper rolls themselves & a bit of Hoisin (which is gluten-free) sauce. I felt quite satiated after this & for a change, did not crave my normal home made chocolate. One cup or organic Qi berry white tea. Tuesday: Again, not an overly stressful morning despite the boys being at their normal full volume & full energy when they woke up around 630am (I never check the time when they wake!). 715am: 1 cup of Qi berry white tea. Breakfast: 3 slices Naturis rice loaf with organic olive oil, oregano & Himalayan pink salt. Early Lunch at 1145am: leftovers from last night – roast sweet potato, broccoli & cauliflower. 1pm: almond milk coffee. I am excited to get home & start on module 2 of IIN – I feel that the timing has been amazing with the elimination diet commencing just before IIN as I can empathise with potential clients going through dietary changes. 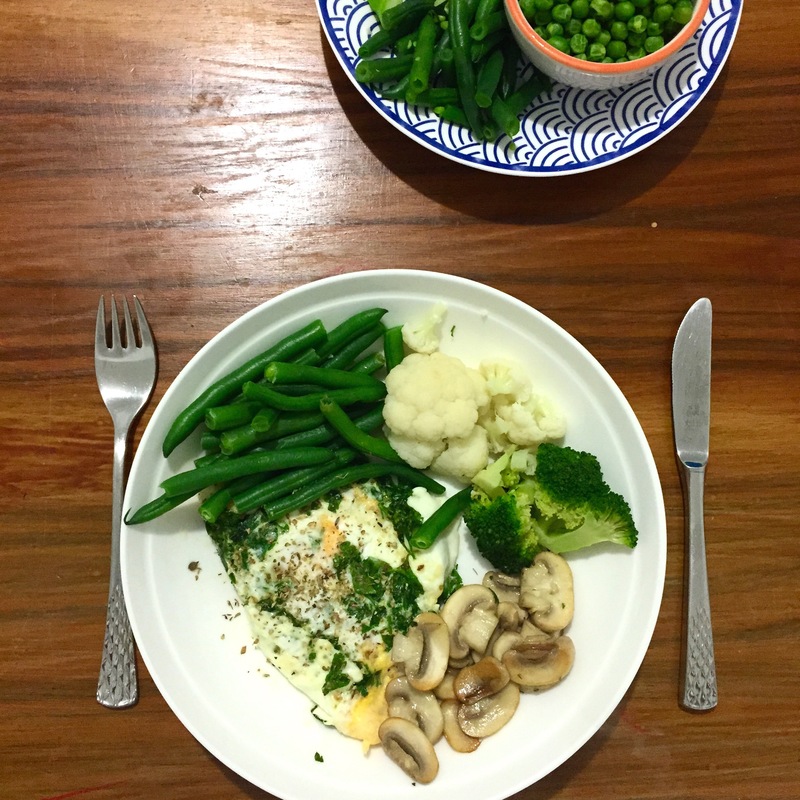 630pm: 2 organic eggs, pan fried with organic parsley as an omelette in organic olive oil, organic broccoli, organic cauliflower, green beans & mushrooms. Wednesday: 830am : 2 slices of Naturis rice toast with organic olive oil, dried oregano & Himalayan pink salt. 12pm: 1 almond milk coffee 2pm: rice noodles, peas, snow peas, mushrooms with gluten-free soy & freshly grated ginger. 230pm: dry roasted mixed nuts (no added salt). Dinner: mini egg tomatoes, snow peas, celery, cos, raw green beans, cos lettuce, a tin of tuna in oil, freshly squeezed lemon & a dressing of olive oil & dijon mustard. Hockey training 715-830pm. After hockey: a cup of peppermint tea, 2 squares of Loving Earth lemon chocolate, which I really wasn’t craving but my brother had left it out on the bench & I just decided to try it while chatting to my Mum & Dad. Thursday: I’ve decided Thursday must be my do-whatever-I-want day. I had an About Life raw vegan caramel slice for breakfast. Judge me all you like! A pot of English Tea Shop organic white tea with blueberries & elderflower. A handful or roasted mixed nuts (from yesterday’s pack). 250g punnet of organic strawberries. A pack of seaweed (weight = 4.5 grams). An organic avocado with Furikake seasoning. This entry was posted in Nutrition and tagged acne, adultonsetacne, dairyfree, dairyfreeglutenfreemeatfree, elminationdiet, glutenfree, IIN, instituteforintegrativenutrition, naturopath, ovvioorganics, spicefree, stress by 6 Clean Ingredients. Bookmark the permalink.